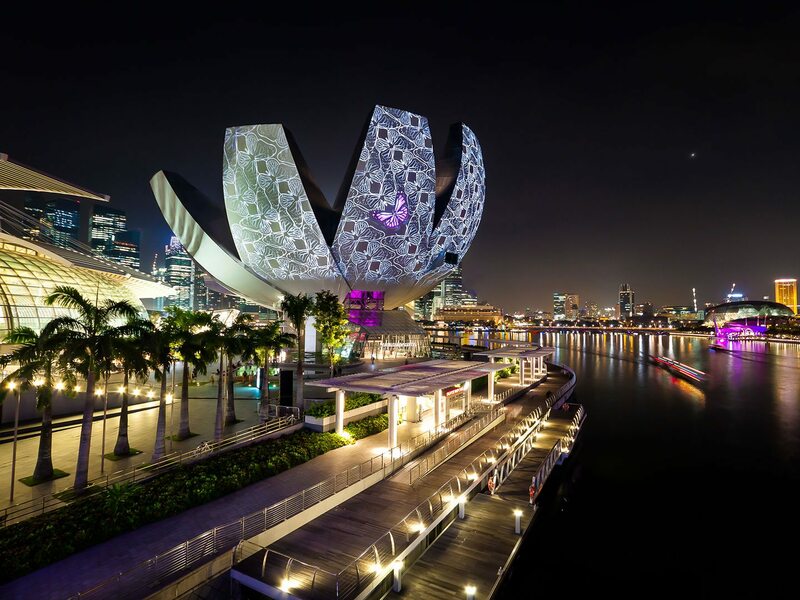 Standing majestically within the integrated resort of Singapore’s Marina Bay Sands, the ArtScience Museum is a strategic venue that beautifully combines art and science with its ever-changing variety of innovative international exhibitions. Collaborating with other well-known organisations, this museum pushes the limits of science, technology and knowledge to a deeper level. This fascinating museum is a living and breathing embodiment of the ArtScience theme, bringing to light the processes at the core of art and science that inevitably help shape the world we live in. 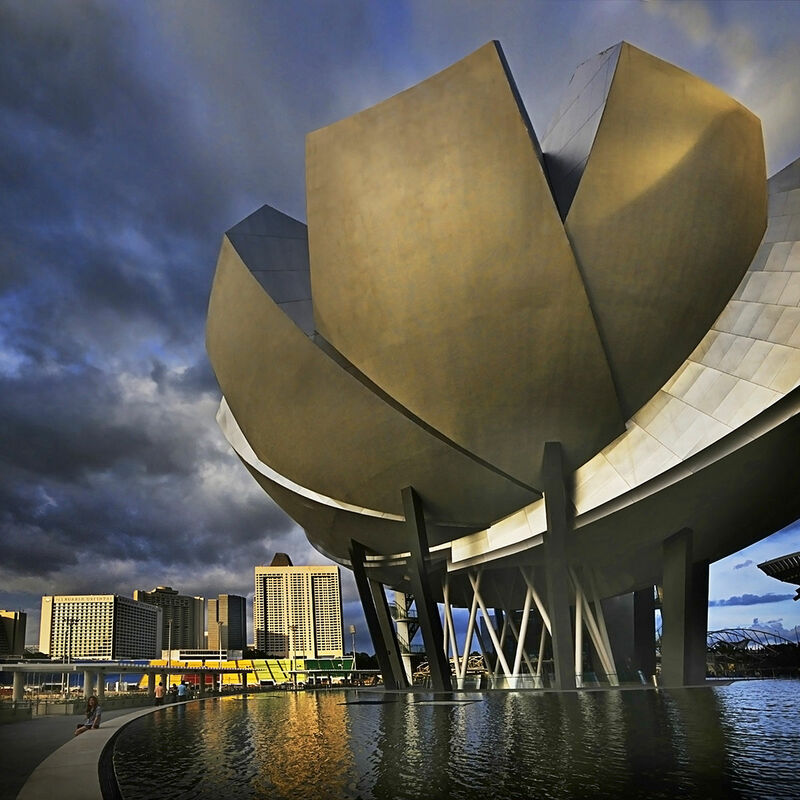 Known as one of Asia’s most uniquely designed architecture, the ArtScience Museum is iconic and its structure symbolises the welcoming hand of Singapore with its ten fingers. The edge of each “finger” filters in natural light to showcase exhibits in the best light. Twenty-one galleries are spread over three storeys with a total floor space of about 50,000 square feet. The ArtScience Museum’s famous exhibition, “The Deep” exclusively portrays underwater sea life where a humungous collection of sea creatures is featured and this was said to be the largest display in Southeast Asia. Another famous display is the Nobel Prize exhibition titled “Ideas Changing the World” as it exhibits how the award has moulded our world. Meanwhile, other exhibitions portray varieties of work from the arts and creative field such as multimedia works by French photographer, Eric Valli, a peep into Dream Works Animation’s “The Exhibition” and the not-to-be-missed permanent exhibition of “Future World: Where Art Meets Science”, a place where visitors could lose themselves in the large 1,500 square-metre interactive art installations with the themes of Nature, Park, Town and Science. Meanwhile, shows that were portrayed at the museum also feature works by American portrait photographer, Annie Leibovitz. Her works include A Photographer’s Life (1990-2005) and Dinosaurs: Dawn to Extinction, which involves the remodeling of an 18-metre Apatosaurus dinosaur with downloadable mobile applications. Other distinguished shows include the display of historical artifacts from the reign of Genghis Khan and even sets and costumes from Harry Potter films.